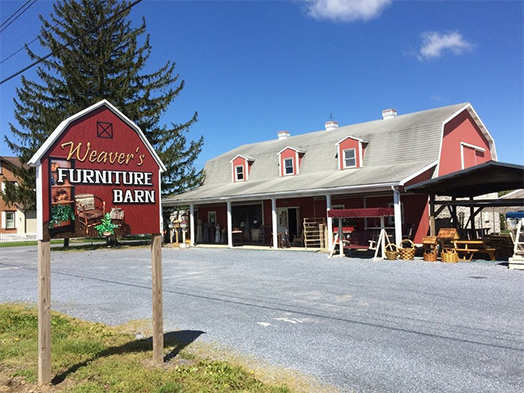 Weaver’s Furniture Barn is a family-owned, multigenerational, and community-integrated business. What does this mean? Let us tell you our story. James Weaver started our business back in 1987 as a produce market. We specialized in family-raised sweet corn, cantaloupes, etc. To add to the variety, we began to offer some items such as butter churns and corner cabinets. Gradually the demand for furniture took over the produce market. By serving the needs of our customers, we discovered the niche we fill today. We endeavor to supply our friends and neighbors near and far with quality-made home furnishings. Some of this furniture is made here in our shop, but the majority is crafted by other shops in the community. Through time our business has grown. We now include a second generation with James Ray (also known as JR) and Julia Weaver in charge of the retail business. Mom and Pop continue to help with behind-the-scenes management. Our goal is to connect you, our customer, with top-of-the-line furniture manufacturers and suppliers. Most manufacturers are too busy to deal with the individual. We capitalize on their area of expertise to bring you the furniture of your dreams. The catalogs you find here on our website are just a sample of the wide range of products we offer. Come to our store, and you will find a catalog corner. Take your time and browse the full selection of what we can provide for you. If you look through our catalogs and still do not find what you are looking for, perhaps we can design and build the piece of furniture you are dreaming about. Our goal is to exceed your expectations. Although special, custom-made furniture allows you to realize your dreams, you should be aware of a few drawbacks. One drawback is the time frame. We take special orders on a “first come, first served” basis. At some times during the year, the lead time may stretch out for weeks or even months. Another drawback is price. Costs can be saved when furniture is production run. When we make furniture to exact specifications, it takes more planning and attention to details. You can expect that custom-made furniture may cost from one and a half to twice the price of production run furniture. Weaver’s Furniture Barn offers custom finishing. Did you find the piece or set you wanted, but want to special order the finish? We can do that for you. We have offered this service for years and have many satisfied customers.